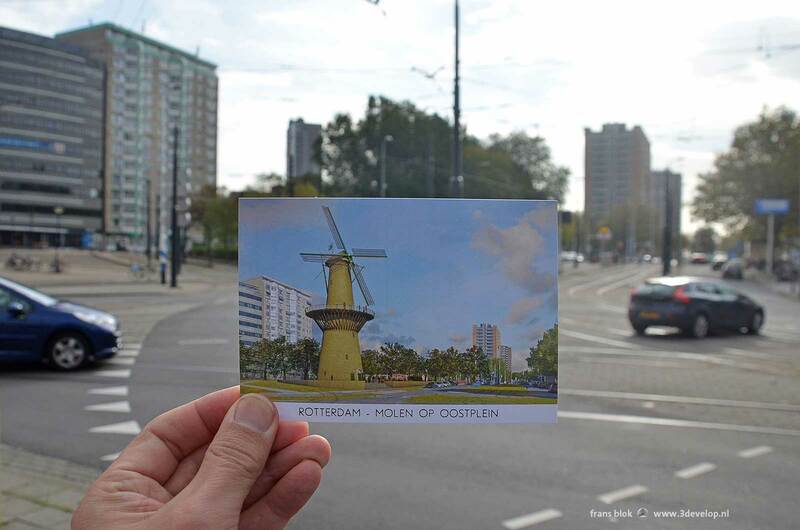 Half a year ago I made an artist impression of windmill De Noord, reconstructed at the Oostplein in Rotterdam. That action remained not completely unnoticed; it’s time for an update. Also the mayor and aldermen, political parties and the media received a copy. The AD/Rotterdams Dagblad published an article which evoked enthusiastic responses from, among others, windmill lovers and shopkeepers on nearby Oostzeedijk. One windmill expert pointed out to me that I had pictured the blades in reverse. Dutch windmills’ blades all appear to rotate in the same direction. 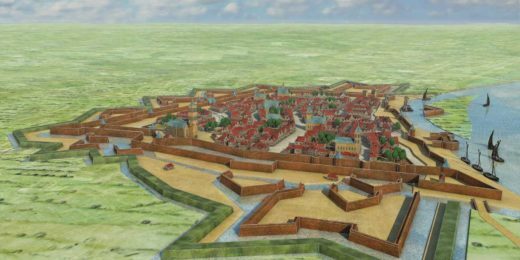 Well, that’s an issue that will certainly be resolved in the case of an actual reconstruction. – How much will the rebuilding cost? 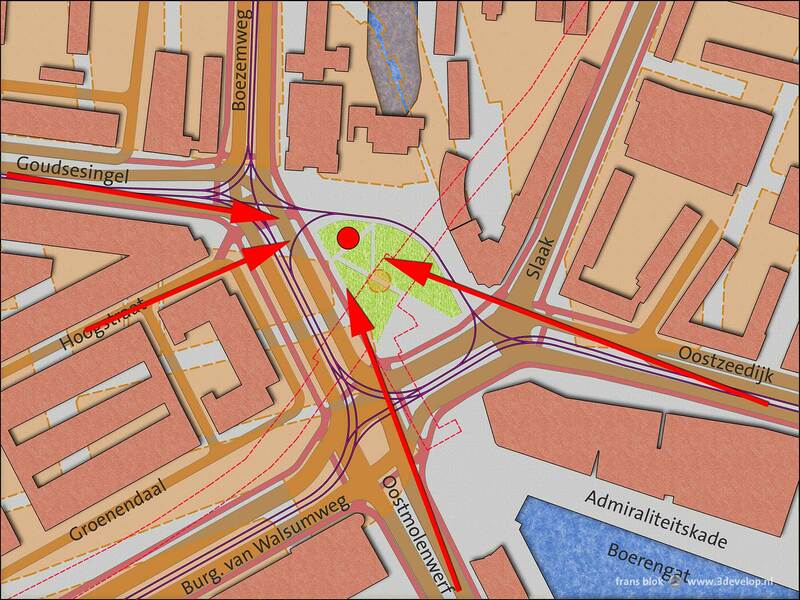 – Where on the Oostplein should the mill be located? Without detailed construction drawings it’s hard to answer the question about the cost. But rebuilding windmills has been done before; some googling shows that budgets are between half a million euros to … a little bit more. Windmill De Kameel in Schiedam was rebuilt between 2008 and 2011 for around 2.5 million euros. And that windmill, with its height of 33 meters (without blades) compares well with windmill De Noord. 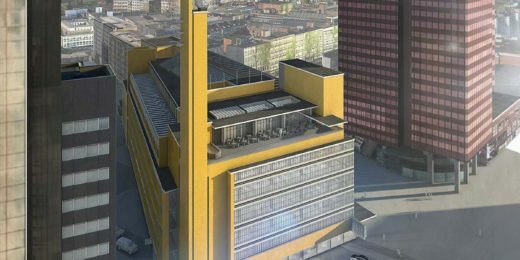 Two and a half million, it’s far above my daily budget, but for a city like Rotterdam it is not too prohibitive. The three Rotterdam city initiatives (Luchtsingel, Ice Rink, Rif010) of recent years, for example, had budgets between three to five million. But then the second question: what’s the correct location? The map below shows Oostplein as it looks today. A rather complicated square; as many as eight roads lead to it. 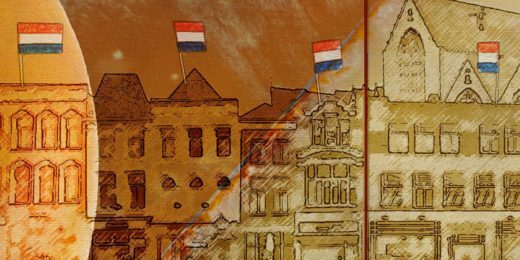 Clockwise: Burgemeester van Walsumweg, Groenendaal, Hoogstraat, Goudsesingel, Boezemweg, Slaak, Oostzeedijk and Oostmolenwerf (East Mill’s Wharf, what’s in a name?). 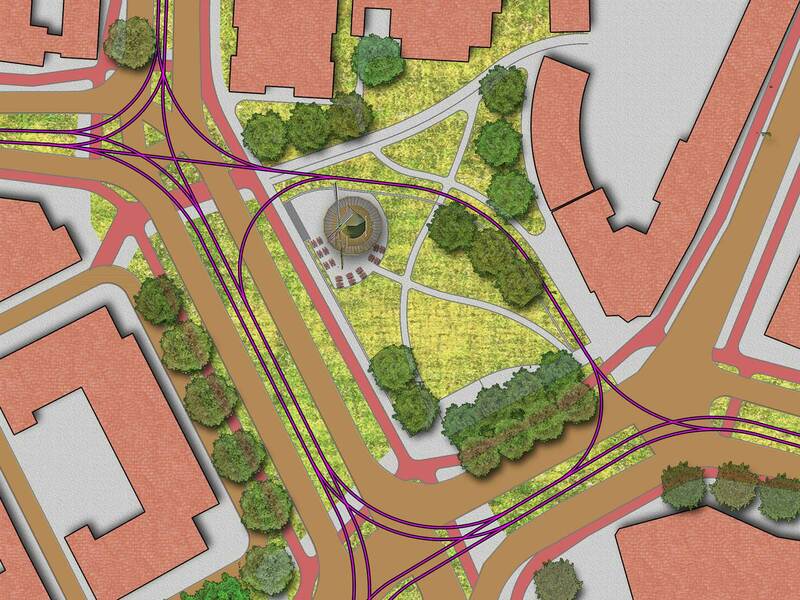 As a result the square is a jumble of car lanes (brown), cycle paths (red) and tram lines (purple). Underground is a metro station (red dotted line) which should be taken into account. In the middle of the square is a tiny park, surrounded by a lot of stony surfaces.